1935. Of the seventeen designs by NBG & Co., for the first Revere Gift Catalog, Few show the innovation and brilliance that Norman Bel Geddes was noted for. Revere catalogs gave designer attribution right from the start. Their designers fared a little better than those of Chase Brass & Copper Co. While Chase did give attribution there were few accolades for their in house people like Howard F. Reichenbach who designed the Gaiety and the Blue Moon Cocktail shakers as well as other items. You can easily find any patent on the new Google Patent site. Just punch up Howard F. Reichenbach to see his designs for Chase, though not every one has been patented. 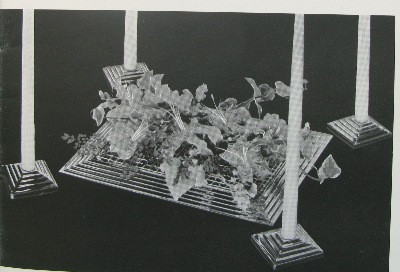 In the first Revere catalog besides Bel Geddes there is also; Elsie Wilkins; with a planter wall piece. Leslie Beaton with a large ash tray, a salt and pepper shaker with designer attribution to William Lescaze of Samuel M. Kootz Associates. And tea pots by Emil Zettler. The last page of the catalog shows the first book scroll by Fred Farr. The Pretzel Tray, in chrome plate and chrome pretzel handles appears for the first and last time. 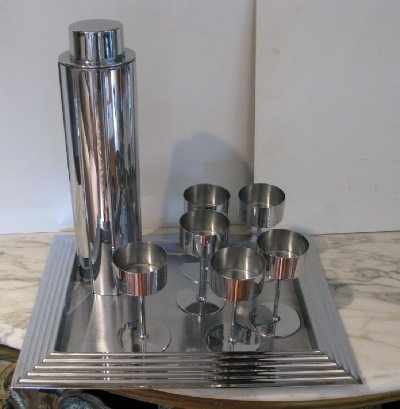 In 1936 the tray has Catalin bar handles and is called the Hercules and later in 1938 is matched up with a cocktail shaker by William A. Welden to form the Empire Set. The stamped design in the Norseman serving tray by NBG & Co. is later used in other trays by in house designers. Service Plates, with the stamped Norseman Bel Geddes design, there is not a designer attribution. Also there is a Norseman Bread Tray with the same stamped design, again with out attribution. On the following page is the NBG & Co. designed Norseman serving tray, with its now famous design. Apparently Revere bought and paid for these designs and could use them anyway they wanted. 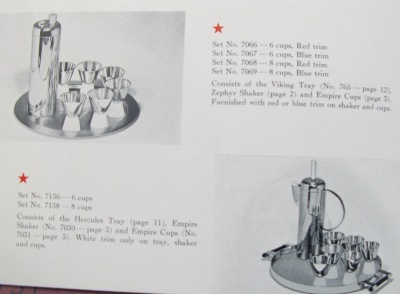 The catalog also shows a Cocktail Hour Tray, by Designer Frederick Priess with the same Norseman design. The Priess tray with blue Catalin trim on the handles would later be matched up with the Zephyr cocktail shaker by W.A. Welden to form the a Cocktail Set. 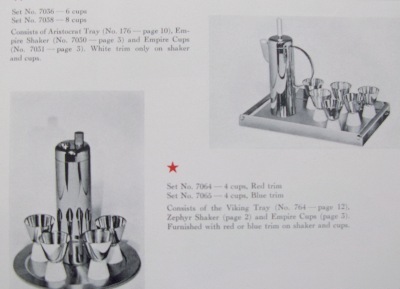 This catalog shows the Bel Geddes cocktail set for the first time. From the catalog; “The Streamlined design of the Revere Cocktail Shaker with its vertical ribs, ……allows a firm grip and makes pouring easier.” There are NBG cocktail shakers and cups with out the Revere stamp on the underside in circulation. I’m thinking these are from this first set in 1936 which may have been hastily added to the catalog. The unstamped cups are 1/8 inch shorter in height. This should not detract from value, but rather used as an indicator of age. At times serendipity and necessity come together to turn the everyday into pure genius. And this may have happened to this cocktail set. 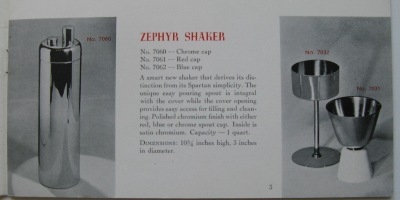 There were other cups and a circular tray blueprinted and slated for production to match the cocktail shaker. But why tool up for this when you have a tray in the catalog already and a power press stamping & extrusion die for the top of the cocktail shaker that you can use for the cup bowl. So it was, it all came together to form a brilliant cocktail shaker set. Manhattan Centerpiece. No wonder the trays are so easy to find compared to the shaker or cups. 1937. A dozen designs by now Head of Design William Archibald Welden. 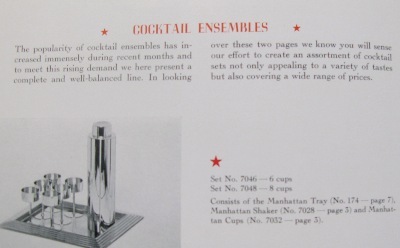 The Bel Geddes cocktail set is still called The Revere Cocktail Ensemble. There is a new serving tray, the Aristocrat, by designer Charles Harmann that will later be matched with a Welden shaker to form a cocktail set. The Vikings serving trays appear again with the Norseman design, less any designer attribution. 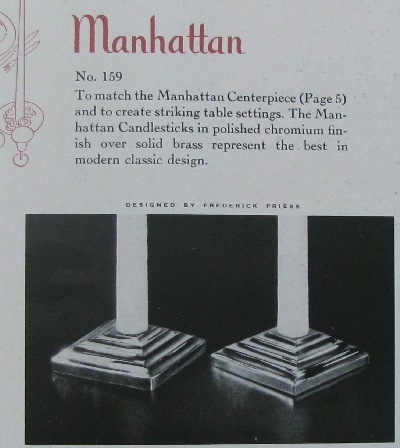 And Manhattan Candlesticks by Frederick Priess are shown for the first time to match the Manhattan Centerpiece. Said candlesticks are often wrongly attributed to NBG & Co. because they match his tray. 1938 & 1939. The 1938 to 1941 catalog pages of cocktail shakers shown here were generously sent to me by a long time employee of Revere Ware Corporation Kay Summers in 1986. We are indebted to her for this valuable information. The Bel Geddes archives, in Texas, had only the first gift catalog. 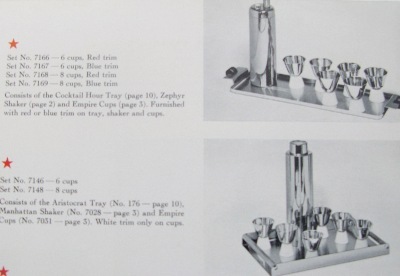 The two cocktail shaker designs by Welden; Empire & Zephyr, are matched up with the Hercules tray to form the Empire Set. And the Zephyr is matched up with the Viking tray to form the Park Cocktail Set. Revere mixed and matched the three cocktail shakers with other trays to form seven cocktail sets. Six sets using the Welden designed cups! 1940. Six cocktail sets are offered. The Bel Geddes Manhattan cups are dropped, giving the cups a short life span of only four years. The Manhattan set now consists of the Bel Geddes Shaker and tray matched with the Welden cups. 1941. The NBG cocktail shaker is dropped from the catalog. Revere is down to four mixed and matched William Archibald Welden sets, using the Empire & Zephyr cocktail shakers. The Bel Geddes Manhattan Tray is still offered as a center piece or serving tray in the front of the catalog. 1942. The must have been a 1942 catalog prepared, but the gift ware line and the day of the cocktail shaker ended on December 7, 1941. The Revere Catalog had a life of seven years, 1935 to 1941. 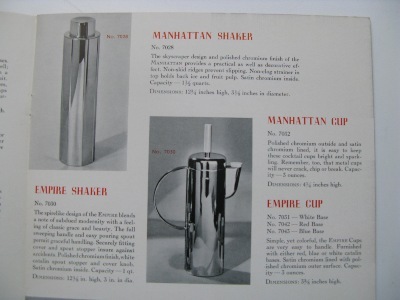 As the depression continued and sales slowed after 1939 the Manhattan cups are dropped from the 1940 catalog with a life of only four years (1936-1939, the shaker is dropped in 1941 with a life of only five years (1936-1940) and the Manhattan tray is found in the 1941 catalog, giving it the longest life of seven years. & cups offered only 4 years. no wonder we can not find cups. WE SEE THE TWO WILLIAM ARCHIBALD WELDEN COCKTAIL SHAKERS & CUPS FOR THE FIRST TIME. STEPHEN VISAKAY © COPYRIGHT. ALL RIGHTS RESERVED. ANY USE OR DUPLICATION WITHOUT THE EXPRESS WRITTEN CONSENT OF THE AUTHOR IS PROHIBITED.